Home > New projects - Pune > Real Estate - 6 Indian Cities Bengaluru, Hyderabad,Pune, Chennai, Delhi,Mumbai Among the World’s Fastest Growing..! Real Estate - 6 Indian Cities Bengaluru, Hyderabad,Pune, Chennai, Delhi,Mumbai Among the World’s Fastest Growing..! Real Estate - Six Indian Cities, Bengaluru, Hyderabad,Pune, Chennai, Delhi,Mumbai Among the World’s Fastest Growing..! India is home to six of the world’s 30 most dynamic cities. In JLL’s City Momentum Index (CMI) 2017, the country’s primary IT and technology hub – Bengaluru – sits right at the top. It is followed by Hyderabad at No. 5; Pune at No. 13; Chennai at No. 18; Delhi at No. 23 and Mumbai at No. 25. Among the most densely-populated areas on Earth, these cities have shown the fastest change on key parameters to emerge in the global top league. Along with Hyderabad, Bengaluru also lead the rise of agile emerging world cities figuring with best-in-class examples such as Shanghai, Shenzhen and Dubai. Being India’s leading IT hub, Bengaluru has attracted a range of the world’s leading technology firms, apart from nurturing successful start-ups. This is driving strong real estate demand which, backed by exceptional levels of growth, has propelled the erstwhile ‘Garden city’ to the top of this Index. Similarly, Hyderabad has attracted major investments from the likes of Microsoft, Apple and Uber as a national technology centre. 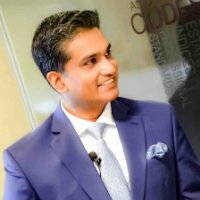 The city’s leadership has been instrumental in enabling Hyderabad to keep pace with Bengaluru – helping to set up India’s largest incubator, focusing on specific niche industries such as gaming and animation and building business attractiveness – all of which helped the ‘city of pearls’ in making it to the global top five. However, ensuring that infrastructure keeps pace with the city’s rapid development is expected to remain a priority for the city. After several deferments, the Hyderabad metro system is set to open in 2018. Similarly, Bengaluru faces challenges in maintaining its momentum, with infrastructure deficits and room for further improvements in market transparency. Chennai, Delhi, Mumbai and Beijing feature in the Top 30 but their positions are compromised by poor scores on environmental sustainability. Affordability and space constraints are hindering momentum in some cities. For example, San Francisco that has fallen out of the Top 20 for the first time and Hong Kong that could not make it to the top group partly due to supply constraints stifling momentum. 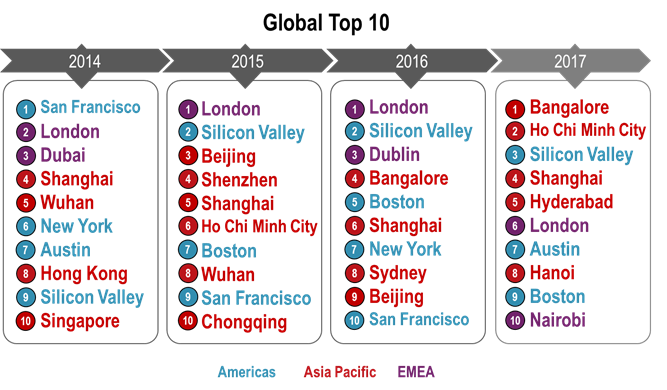 Tokyo and Seoul, which were in the top 20 in CMI 2016, have fallen out of the top positions, ranking in the mid-30s. While both cities finish in the top 10 on long-term momentum, they have disappointed on short-term economic and real estate momentum during 2016. Singapore failed to make the top cut due to a continuing correction in office and retail rents, and sluggish net absorption. Meanwhile, its long-term strengths are in part offset a slowdown in labour force growth. 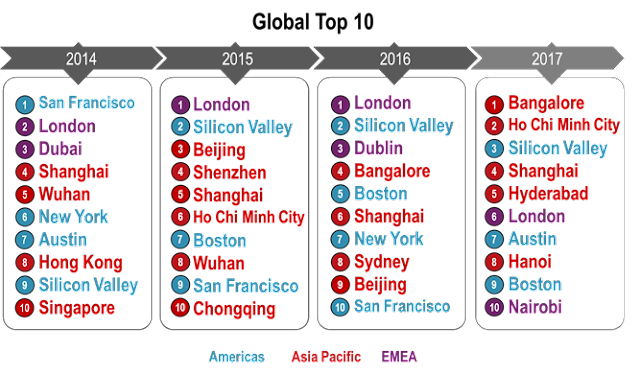 Overall, however, the rise of Asia Pacific region’s cities shows how they are major hubs of commerce and innovation.